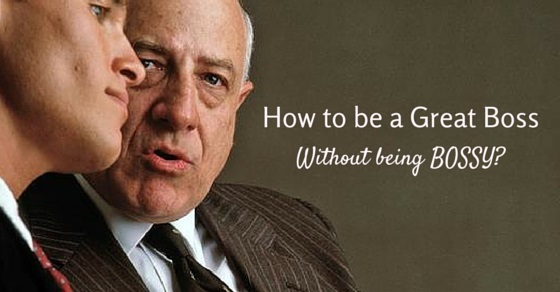 How To Be a Great Boss Without Being Bossy? Everyone is a leader in some or the other way. If we look at business, we lead our divisions, businesses and projects. There is a very thin line between being a boss and being a leader. Juniors often find it annoying and losing self-respect when they work for a person who is just being bossy. Are tyrannical bosses a work of fiction? Well, maybe not. They do exist in reality and are every worker’s worst nightmare. There are a few people who wield their positional power over their juniors, their employees. But it doesn’t always help and doesn’t do them much good. People think that by being authoritarian, they will bring out the best in their employees but it is not so always. When employees are treated disrespectfully, they resent it, naturally, and do not perform to the best of their ability. The reason is very simple, most of us will agree that if we, our work is appreciated, we will go the extra mile to complete it. No one feels good when being bullied and there is not much difference between over bossiness and bullying. So, how to deal with it if you feel that maybe, not intentionally but you are being bossy? If you aren’t prepared to admit that you are bossy, take a few steps to change the way things are working in your work place. Let go of small things that symbolize your “I-am-all-powerful-attitude”. For example, the premium parking spot that you don’t use much since you have a chauffeur driven car that comes on call, most comfortable chair in the office that is lying unused since you have back problem and use a medicated seat, or even a small item such as stationery items like stapler, adhesive etc., if such things can be used by someone in a better way than you, give them to the concerned person. Having the best thing doesn’t make a person the best boss, attitude does. If you are ready to forego such items in the interest of your staff, you are on your way to becoming a good boss who doesn’t holds things just for show-off. If someone does something good for you, say thank you. You can say it in person or on the phone. Use it when you send an email or when you send an office memo. Being the boss doesn’t mean that you ditch the old mannerisms of please and thank you. It is not your license to ignoring the basic decency. Do not be rude; instead be a role model for others. Also, you are not an animal that comes and barks; you are a human being, make your words sound polite. People are sometimes not being bossy but their body language exudes it. Maintaining a professional body language at work is always important. You might be same, even without knowing it. You don’t need to be loud and extremely extrovert to show that you have authority. Often our breathing process is impacted by our situations. When we are stressed, it becomes more difficult to take proper big breaths and at that time, we speak more speedily and quickly. We sound high pitched and monotone, when we do this. So, in such circumstances, take deep breaths inside your stomach first before you speak so that you have a control over your voice. Many adults carry with them a few notions of what real bossiness is and it stems from the things learnt at childhood. Even children can realize the difference between normal discipline and dominating attitude. Never be arrogant and don’t use the “Just because I said No, it means a No” attitude on your subordinates. They are humans like you and so are you. You are not a monarch, don’t behave like one. People who are seen as bossy are the ones who are usually seen as too focused on their own outcomes, ideas and they often forget to credit the contribution of other people in the work. Make a conscious effort to acknowledge others’ contributions and also praise them for the same. This good work will go a long way in dispelling your reputation of being bossy. Bossy leaders tend to over control and micromanage. This often threatens others’ sense of security, confidence, autonomy and trust. To counteract it, you should make an effort to take the working style of others also in consideration. Do not stop others from taking lead on projects when appropriate and also seek the consensus of the whole group when faced with a dilemma. When you engage others in problem solving matters, it gives them a sense of ownership about the situation. It is very natural that every person will prefer his own ideas. However it has a flip side as you may be missing out on better solutions. So, next time when you face a doubt, do ask for other’s point of view and when they suggest something, give it a serious thought. Learn to recognize good ideas- even when it comes from others, this is an essential leadership skill. When people come to you with a problem or an issue, put all your attention on them. Turn off the cellphone, take your eyes away from the computer and put aside paperwork. If they come to you it means they view as someone supportive and expect you to support them. Do that, pay full attention to them and save troubles in the long run. People often confuse hearing with listening. Hearing is active listening, focusing on what they say rather than focusing on what you have to say next. A simple way to show that you are actively engaged in the conversation is to ask a few questions in between and as follow up. A good leader, boss should always engage with the staff so that they feel him approachable. A boss thinks that his words are the final ones and no one should have an argument about it. A good boss, however, should consider how his words are being interpreted by others and how other people’s situations might make them see it. Whenever someone comes to you with a problem, think before you respond by thinking how you would react if you were in their place. All find it easy to tell others what they should do, as you want them to do their best. But a better way is to let them ask for your help first. You can facilitate this by asking them what they need help with or what they are struggling with. You can also encourage them to share their problems with you. Threatening to fire someone as a means to get them act professional is not the right way. People have habit of threatening to fire if they don’t do a work right. However, this should come up only when you have serious causes to consider their dismissal. Even then, try and deal with the issue in a diplomatic way rather than shouting and using it as a threat. Good coaches and good bosses help others learn how to deal with their own problems and then come up with their own solutions to the same. They might be having it in them and unable to express it because they never got an opportunity for the same. So, encourage it and when they give suggestions, offer your feedback on it and advice on their solutions, rather than giving the solution itself. Use positive feedback to help others guide them to reinforce positive behavior. If they are wavering in certain issues, then give them feedback and encourage them to do better. The feedback should not only be positive, it should be constructive feedback also stating where they can improve and how it can be improved. No one is saying you have to be the best friend of every employee. It is restrictive to success just like being bossy boss is. Somewhere in the middle is the best bet. Those who are bossy often tend to dictate and mould people as per their own wish. A more positive way to handle the situation is to do so through coaching and mentoring. After you have made some changes in your routine as per above points, it is also important to make people realize that you have changed. You need to change the reputation of being bossy. You can also make it known to them that you are willing to change and ask for their feedback whether they think you are being bossy again. If so, ask how and why. Also, do not forget to say thank you when you get a feedback. To make more impact, you can acknowledge in a meeting or through a written letter.